Traditional pub in the back streets behind the cathedral. The pub has two main bar areas and a couple of dining areas. Some of the seating is formed of old school desks and there are many old college-related items hanging on the wall. I haven’t eaten here recently but the food has always been good in the past and one time when I mentioned that we were celebrating our anniversary they gave us a bottle of champagne. 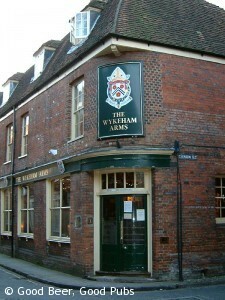 In the early 1990s the Wykeham Arms was an Eldridge Pope pub. Eventually it was taken over by Gale’s so then it bacame a Fuller’s pub. The beer has always tasted well kept and the selection is mainly Fuller’s. London Pride, Gales HSB and Seafarers are usually available. There is also a regular guest ale. Goodens Gold from the local Flowerpots Brewery was superb on my last visit. You can stay here if you want to but it’s quite pricey. I used to always come here to watch the 5 and then 6 Nations rugby matches as the atmosphere could not be beaten, but they don’t seem to show them any more which is a shame.